3. Handicap ratio: 90% of 210 - Composite USBC 2017/18 book average of 21 games or more. If no USBC 17/18 book average, we may consider using your current 2018 highest average of 21 games or more—Please bring a league standings sheet as proof). We may also consider using a re-rated established average from another tournament or if you've bowled enough games in our past tournaments for us to give you an average. Or -- your current 2018 Highest league average. Please bring proof with latest standings. - At the tournament director's discretion, we may re-rate bowlers that have increased their average 15 (or more) pins in the last year. We may also re-rate bowlers that have bowled in other Bowling200.com tournaments in past years who have consistently averaged 10-15 or more pins over their book average We do not re-rate bowlers based on earnings, but on consitant performance of bowling higher than book average. Bowlers that have been re-rated by other tournaments may have to use their re-rated tournament average - at the director's discretion. Please inform us if you have been re-rated for a tournament. 4. A Doubles Team may be any combination of male or female bowlers. 5. There is No Max Team Cap (or Alibi TeamMax Team Cap), which means any bowler may bowl with any other bowler. All Scratch Bowlers can bowl together as a team. 6. Important: The Maximum Handicap score per game by a single bowler allowed is 300. 8. Bowlers may re-enter the tournament and cash more than once, but may only cash 1 time with the same partner. 9. Bowlers may only win 1 (one) place in side pots for each division - Handicap and Scratch. 10. It is the bowler's responsibility to verify the accuracy of his or her own average. Failure to use proper average shall disqualify scores if the submitted average is lower than the actual average. 11. The tournament directors may add or alter squad times of additional Squads during the course of the tournament as deemed necessary. 12. We ask that Bowlers do not record their own scores. Opposing team bowlers or Staff at your pair of lanes can record your scores. If you are unsure, please contact tournament staff or bowling center staff. 13. Profanity, Cheating or abuse of equipment is not allowed. 16. PBA or PWBA Members / Cardholders are not permitted to bowl in this tournament. National or Regional Title Holders are not allowed to bowl in this tournament. If you have ever participated in any PBA Bowling Event and came in 1st Place in that Pro Bowler's Event, you are not eligible to bowl in this tournament. 18. 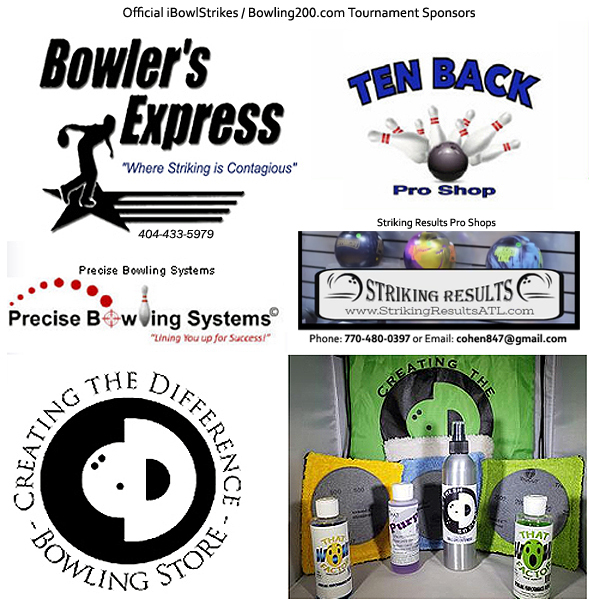 Should the 2019 iBowlStrikes / Bowling200.com Winter Bowling Tournament event be cancelled due to circumstances beyond our control such as weather, or any other circumstance(s) beyond the tournament's control, the Bowling200.com Tournament will endeavor to set new dates for the event to make up for any possible lost tournament days or squads. It shall be the Bowler's responsibility to inform the Tournament Directors if his or her average has been re-rated or adjusted. The re-rated and/or adjusted average may be used during the tournament. Failure to inform the tournament directors of re-rated averages may result in a disqualification. Bowlers are responsible for verifying his/her average whether submitted by the bowler, the team or others. If the submitted average is lower than required and results in lower classification or more handicap, the bowlers scores are disqualified.The tournament managers or directors reserve the right to reject any entry or re-rate any bowler. The decision of the tournament directors shall be final. If the bowler does not accept the re-rate average, the entry fee shall be refunded.